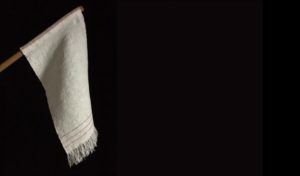 In the spring of 1865, a seemingly unremarkable dishcloth played a crucial role in ending the Civil War as the South’s flag of surrender at Appomattox. 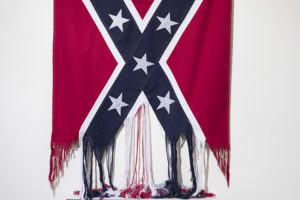 In Monumental Cloth, The Flag We Should Know, textile and social practice artist Sonya Clark debuts six new works across two floors at The Fabric Workshop and Museum. Focusing specifically on this Confederate Flag of Truce, the exhibition explores the legacy of symbols and challenges the power of propaganda, erasures, and omissions. By making the Truce Flag – a cloth that brokered peace and represented the promise of reconciliation – into a monumental alternative to the infamous Confederate Battle Flag and its pervasive divisiveness, Clark instigates a role reversal and aims to correct a historical imbalance. The Fabric Workshop and Museum is housed in a former flag factory, a particularly fitting place to ask questions about the symbolic power cloth can hold in the consciousness of our nation. 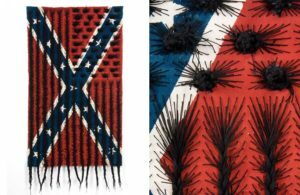 Monumental Cloth, The Flag We Should Know is a timely catalyst for dialogue about the scars of the Confederacy and America’s ability to acknowledge and reckon with racial injustice. The exhibition is the culmination of Sonya Clark’s two-year residency with The Fabric Workshop and Museum, as well as a homecoming of sorts. The artist began her career as an Apprentice at FWM in 1993. 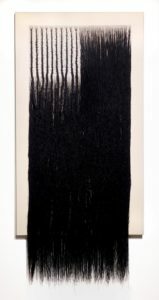 Since that time, Clark has received numerous awards, including the James Renwick Alliance Distinguished Educator Award (2018), Anonymous Was A Woman Award (2016), ArtPrize Juried Grand Prize (co-winner, 2014), Smithsonian Artist Research Fellowship (2010 and 2011), and Pollock Krasner award. Her work has been exhibited in more than 350 museums and galleries throughout the world. For 12 years, Clark served as a professor and chair of the Department of Craft and Material Studies at the Virginia Commonwealth University School of the Arts in Richmond, Virginia. She is currently Professor of Art and the History of Art at Amherst College where she received an honorary doctorate in 2015. Deeply committed to the field of craft, Clark has also served on the board of the American Craft Council (Minneapolis, MN), Textile Museum (Washington, DC), and Haystack Mountain School of Crafts (Deer Isle, ME).